Tower defense games have taught us little. We already knew that defending castles from baddies was fun and that legions of weenies are the key to success in most real-time strategy situations. What other insights have they to offer? How about a lesson in sweatshop economics? UK game developer Littleloud primarily makes licensed games for the BBC and various film studios. But their new game Sweatshop is an entirely different beast, though it was still made in association with UK TV station Channel 4. The art design in this free Flash game is all sprightly and charming pixels with a soundtrack similar to Scott Pilgrim: The Game. The subject matter is something else altogether. Players begin the game as a trainee sweatshop manager. Every stage tasks them with meeting garment production quotas by placing the correct towe... ahem... workers at strategic locations on an assembly line. Different workers are better at making certain types of clothing, which come in waves of different types, and they can be upgraded to improve their performance. Mechanically, this is a straight-up tower defense game. The intro and first level of the game. But the controversial sweatshop elements spice the game up enough to make it worth playing for even the most jaded desktop defender. Completing stages fast leads to a higher score. Players can increase the speed of the conveyor belt that carries the garments, forcing their towers/workers to do their jobs faster. Since the towers are poorly-paid human beings instead of actual towers, they tire. Players can build items like water fountains and radios to keep re-energizing them, or simply allow them to die and replace them with fresh workers. The in-game fiscal costs are comparable. Like most tower defense games, a score is handed out at the end of each stage, and in this case, it factors in the number of garmets made correctly, time taken, and cash left on hand. There are no points awarded for keeping workers alive. I have tried playing the game "nicely" and "sadistically" and both worked out the same for my score. There is even a CV players can view that keeps track of just how evil or benevolent they have been throughout the game. The serious message is reinforced by the dialog between stages (hilarious and heart-wrenching) and blurbs accompanying each score breakdown that impart sobering real-world facts about the horrors of sweatshop labor. It's message is reminiscent of the controversial game Smuggle Truck. 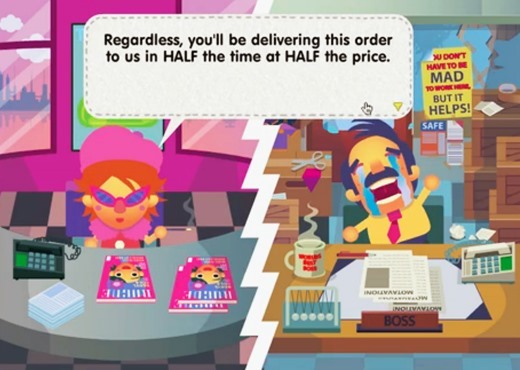 Despite all of its effective preaching, Sweatshop is a fun game which also reminds me of Theme Hospital, another game on a very short list of moralistic comedic business simulators. The graphics, black-hearted sense of humor, and music elevate the mood of the game and make learning about sweatshop labor as accessible as it could possibly be. And they say video games don't teach kids anything. Erm BBC 4 and Channel 4 are very different channels, I think based on the SweatShop website that this game has actually been made with Channel 4 rather than BBC4. I suggest a correction to this article. Indeed, astute reader Matt SB! Thanks for pointing that out. I got my state-owned UK TV stations with 4's in their names confused. This game was in fact made in association with Channel 4, not BBC Four. Sweatshop is weird and ! @#$ing hard.